Yumas from "United States and Mexican Boundary Survey. Report of William H. Emory" Washington. 1857. Volume I. 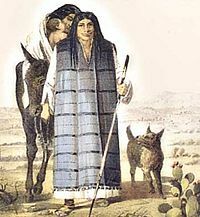 The Yuman are Native American tribes who live along the lower Colorado River in Arizona and California as well as in Baja California. The River Yumans, including the Mohave, Cocopah, Maricopa, and Quechan tribes, inhabited the areas along the Colorado River near the junction with the Gila River; the Upland Yumans, including the Hualapia, Havasupai, Yavapai, Kumeyaay (Diegueño), Kiliwa, and Paipai tribes, lived near the Grand Canyon and areas of Southern California, particularly Baja California. The languages of the Yuman tribes are classified into the Yuman language family, which may form part of the hypothetical Hokan linguistic phylum. Generally, the Yuman were physically powerful and warlike in character. When the Spanish explorers and missionaries arrived, encountering the various Yuman tribes they met resistance both physical and with regard to their beliefs. Large numbers of Yuman died in conflicts, with the Spanish and later the American cavalry who defended forts along the Colorado River. Disease also reduced their numbers and weakened them to a point of submission when they were forced onto reservations. Today, the majority still live in poverty on various reservations, but for some, particularly the Havasupai who inhabit a spectacular area within the Grand Canyon complex, tourism and crafts, as well as casinos, are valuable supplements to their subsistence farming. Educational programs have been established to preserve their traditional ways and beliefs while combining these with contemporary technology and knowledge in order to build a better future. The term Patayan is used by archaeologists to describe the prehistoric Native American cultures that inhabited parts of modern day Arizona, California and Baja California, including areas near the Colorado River Valley, the nearby uplands, and north to the vicinity of the Grand Canyon. These prehistoric people appear to be ancestoral to the Yuman. They practiced floodplain agriculture where possible, but relied heavily on hunting and gathering. The historic Yuman-speaking peoples in this region were skilled warriors and active traders, maintaining exchange networks with the Pima in southern Arizona and with the Pacific coast. 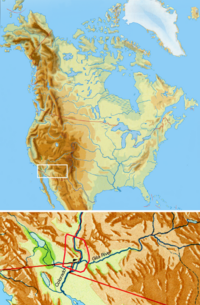 The Yuman can be divided into two distinct groups: The River Yumans inhabited the areas along the Colorado River near the junction with the Gila River; the Upland Yumans lived near the Grand Canyon and areas of Southern California, particularly Baja California. The Mohave, Cocopah, Maricopa, and Quechan are included in the River Yumans, while the Hualapia, Havasupai, Yavapai, Kumeyaay (Diegueño), Kiliwa, and Paipai are the main tribes of the Upland Yumans. The sixteenth century Spanish expedition under Hernando de Alarcón, intending to meet Francisco Vasquéz de Coronado's overland expedition, visited the peninsula of Baja California and then traveled along the lower Colorado River. This was the first European expedition to reach Yuman territory. Until the eighteenth century, however, contact with the Yuman was intermittent. For example, the Kiliwa first encountered Europeans when Juan Rodríguez Cabrillo reached the San Quintín area in 1542. Sebastián Vizcaíno's expedition mapped the northwest coast of Baja California, in 1602, and encountered the Paipai. The Jesuit missionary-explorer Wenceslaus Linck came overland from the south into the eastern part of Kiliwa territory in 1766. More intensive and sustained contacts began in 1769, when the expedition to establish Spanish settlements, led by Gaspar de Portolà and Junípero Serra, passed through the western portions of California. Juan Bautista de Anza and his party traveled into Quechan territory in the winter of 1774, marking the beginning of continuous interaction. Today, Yuman tribes live on reservations generally located on part of their ancestral lands. Casinos, farming, and other enterprises provide economic support, as does tourism, particularly for the Havasupai who inhabit a beautiful part of the Grand Canyon complex. Yuman people generally had a loose political organization, and lived in small, impermanent settlements. Generally, the tribes were warlike in spirit, and valued success in battle over material possessions. They had no concept of inheritance. Upon the death of a tribe member, the land they had farmed was usually abandoned and their property destroyed. Typical crafts included pottery and basketry. The Yuman peoples were tall and powerful, and wore minimal clothing, usually sandals and an apron or breechcloth. They were described by a Spanish explorer as "the tallest and the most robust that I have seen in all the provinces, and their nakedness the most complete" (Waldman 2006). In the winter, they wore robes made from the skin of deer and rabbit. Traditional Yuman beliefs are characterized by a creation myth and belief in a supreme creator. They passed on their faith through traditional narratives and songs. Although Christian missions were established in their territories, particularly by the Spanish, belief in their old traditions has continued, albeit with some Christian influence. Today, educational programs work to preserve the ancient tribal ways and beliefs combined with contemporary cultural and technological understandings. The River Yuman, who inhabited the area around the lower Colorado and Gila Rivers, farmed the floodplain. Annual flooding of the rivers deposited silt and naturally irrigated the land, making for fertile soil. They lived in small settlements above the floodplain where they established rectangular, open-sided dwellings. In the period after the floods until fall the people farmed small plots of land owned by each family, living in small dome-shaped wickiup shelters. The Cocopah lived in Baja California, Mexico, and some emigrated and settled on the lower reaches of the Colorado River. As of the 2000 census a resident population of 1,025 persons, of whom 519 were solely of Native American heritage, lived on the 25.948 km² (10.0185 sq mi) Cocopah Indian Reservation, which is composed of several non-contiguous sections in Yuma County, Arizona, lying southwest and northwest of the city of Yuma, Arizona. There is a casino and bingo hall on the reservation. The Maricopa, or Piipaash, formerly consisted of small groups of people situated on the banks of the Colorado River. Today, they live in the Salt River Pima-Maricopa Indian Community and Gila River Indian Community along with the Pima, a tribe with whom the Maricopa have long held a positive relationship. They Robert "Tree" Cody, a notable performer of the Native American flute is of Maricopa and Sioux heritage. Mohave and Mojave are both tribally accepted and interchangeably used phonetic spellings for these people known among themselves as the Aha macave. Their name comes from two words: Aha, meaning "water," and macave, meaning "along or beside," and to them it means "people who live along the river." Today, many of the surviving descendants of these indigenous old families live on or near one of two reservations located on the Colorado River. The Fort Mojave Indian Reservation established in 1865 includes parts of California, Arizona, and Nevada. The Colorado River Indian Reservation was established in 1870 and includes parts of California and Arizona and is shared by members of the Chemehuevi, Hopi, and Navajo nations. Both reservations include substantial senior water rights in the Colorado River, which are used for irrigated farming. The tribal headquarters, library, and museum are in Parker, Arizona. The National Indian Days Celebration is held annually in Parker, during the last week of September. The All Indian Rodeo is also celebrated annually, on the first weekend in December. The Quechan (also Yuma, Kwtsan, Kwtsaan) live on the Fort Yuma Reservation on the lower Colorado River in Arizona just north of the border with Mexico. The reservation is a part of their traditional lands. 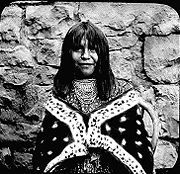 The Quechan are one of the Yuman tribes. They should not be confused with the Quechuas, which is the term used for several ethnic groups that use a Quechua language in South America, particularly in Peru, Ecuador, Bolivia, Chile, and Argentina. Quechan traditional narratives include myths, legends, tales, and oral histories preserved by the Quechan people. The Southern California Creation myth is particularly prominent in Quechan oral literature. 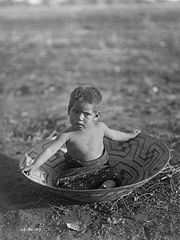 This and other narrative elements are shared with the other Yuman-speaking peoples of southern California, western Arizona, and northern Baja California, as well as with their Uto-Aztecan-speaking neighbors. In 1884, a reservation was established on the California side of the river for the Quechan. The Fort Yuma Indian Reservation has a land area of 178.197 km² (68.802 sq mi) in southeastern Imperial County, California, and western Yuma County, Arizona, near the city of Yuma, Arizona. The reservation consists of part of their traditional lands. The 2000 census reported a resident population of 2,376 persons on the Fort Yuma Indian Reservation, only 56.8 percent of whom were of solely Native American heritage, and more than 27 percent of whom were white. The Upland Yuman were closer in lifestyle to the desert cultures of the southwestern United States. While they did some subsistence farming, they generally practiced a hunter-gatherer lifestyle. 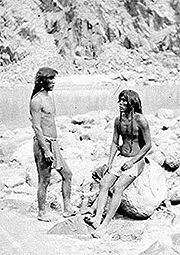 The Havasupai, mostly due to their location in the Grand Canyon, practiced more extensive farming and lived a peaceful lifestyle. The others, like the River Yumans, were warlike in nature. The Yavapai in particular often allied themselves with Apache for the purpose of raiding. When Juan Rodríguez Cabrillo sailed north he saw several Kumeyaay Indians waiting on shore. They had long hair, some in braids and adorned with feathers or shells. Some men wore capes made from the skin of sea otter, seal or deer. The Diegueño, also known as the Kumeyaay, live in the extreme southwestern United States and northwest Mexico, in the states of California and Baja California. In Spanish, the name is commonly spelled kumiai. The Kumeyaay live on 13 reservations in San Diego County, California (Barona, Campo, Capitan Grande, Ewiiapaayp, Inaja, Jamul, La Posta, Manzanita, Mesa Grande, San Pasqual, Santa Ysabel, Sycuan, and Viejas), and on four reservations in Baja California (La Huerta, Nejí, San Antonio Nicuarr, and San José de la Zorra). The group living on a particular reservation is referred to as a "band," such as the "Viejas Band of Kumeyaay Indians." The Hualapai (also spelled Walapai) live in the mountains of northwestern Arizona, United States. The name is derived from hwal, the Yuman word for pine, Hualapai meaning "people of the tall pine." Their traditional territory is a 100 mile (160 km) stretch along the pine-clad southern side of the Grand Canyon with the tribal capital located at Peach Springs. It is estimated that one-third of the Hualapai people were killed during the Hualapai War from 1865 until 1870, either by the conflict or from disease. This war was caused by an increase in traffic through the area on the Fort Mojave-Prescott Toll Road which elevated tensions and produced armed conflicts between the Hualapai and the European Americans. The Hualapai cut off the route from Prescott, Arizona to the Colorado River ports. Fighting continued despite efforts at peace treaties and the cavalry from Fort Mojave were mobilized, attacking Hualapai rancherias and razing them. The Hualapai began to surrender as whooping cough and dysentery weakened their ranks, with the final surrender after five years of conflict. 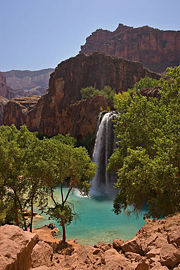 The Havasu ’Baaja (meaning the-people-of-the-blue-green-waters), or more commonly the Havasupai, are located in the northwestern part of the American state of Arizona. The tribe is well-known for being the only permanent inhabitants in the Grand Canyon, where they have lived for over 800 years. They used to spend the summer and spring months in the canyon farming, while spending the winter and fall months hunting on the plateau. In 1882, the U.S. government formed the Havasupai Indian Reservation which consisted of 518 acres (2.10 km²) of land inside the canyon. For 93 years they were confined to staying inside the canyon, which led to an increased reliance on farming and outside revenue tourism. In 1975, the U.S. Government reallocated 185,000 acres (750 km²) of land back to the Havasupai. The main "claim-to-fame" for the tribe is its richly colored waters and its awe-inspiring waterfalls, both of which have made this small community become a bustling tourist hub that attracts thousands of people every year. Yavapai basket, early twentieth century willow and cane. This object is exhibited at the Iris & B. Gerald Cantor Center for Visual Arts, Stanford University, California. Yavapai live in central Arizona. 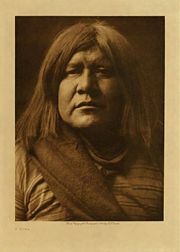 The Yavapai have much in common, linguistically and culturally, with their neighbors the Havasupai, the Hualapai, and the Athabascan Apache (Gifford 1936, 249). Yavapai often allied themselves with bands of Apache for raiding and were mistaken as Apache by settlers, being referred to Yavapai-Apache. Before the 1860s, when settlers began exploring for gold in the area, the Yavapai occupied an area of approximately 20,000 mi² (51800 km²) bordering the San Francisco Peaks on the north, the Pinal Mountains on the east, and Martinez Lake and the Colorado River at the point where Lake Havasu is now on the west (Salzmann 1997, 58). The Yavapai people are known for their exceptional baskets. 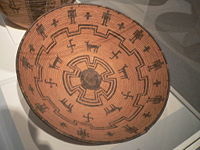 Traditionally, a Yavapai basket has a dark center surrounded by rings representing the mountains, animals, and finally man. It is symbolic of life, and harmony is brought through its order. 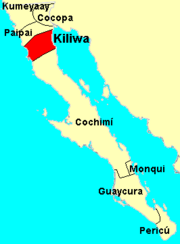 The Kiliwa and Paipai tribes occupied territories in Baja California lying between the Cochimí in the south and the Kumeyaay and Cocopah in the north. They practiced subsistence hunting and gathering of natural animals and plants rather than on agriculture. At least two dozen different plants were food resources, and many others were used for medicine or as materials for construction or craft products. Pit-roasted Agave (mescal; ječà) was the most important plant food. The traditional material culture of the Kiliwa and Paipai was not highly elaborate, as would be expected for a seasonally mobile group. Traditional leadership roles in communities and kin groups were held on a hereditary basis, but subject to an assessment of the individual leader's competence. Leaders' authority does not seem to have been extensive. Shamans were believed to be able to effect magical cures of disease or injuries, or to cause them. They presided at some religious ceremonies, and they were thought to transform themselves into animals or birds and to bring rain. They acquired their powers through dreaming or by taking the hallucinogen Datura. As with other Yuman groups, the greatest ceremonial elaboration seems to have been reserved for rites relating to funerals and the keruk mourning ceremony. The deceased was cremated and his property was destroyed. The main modern settlement of Kiliwa and Paipai is at Santa Catarina, a community they share with Kumeyaay residents. Bee, Robert L. 1983. Quechan. Handbook of North American Indians. Vol. 10, Southwest. Washington, DC: Smithsonian Institution. ISBN 0160045797. Bee, Robert L. Bee, and Frank W. Porter. 1989. 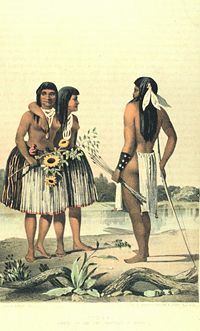 The Yuma (Indians of North America). Chelsea House Publications. ISBN 1555467377. Curtis, Edward S.  2004. The North American Indian. Northwestern University Library. Retrieved September 17, 2008. Curtis, Edward S.  2007. The North American Indian Volume 2. Classic Books. ISBN 1404798021. DuBois, Constance Goddard. 1908. Ceremonies and traditions of the Diegueño Indians. Journal of American Folk-lore 21(82): 228-236. Retrieved September 10, 2008. Erdoes, Richard, and Alfonso Ortiz. 1985. American Indian Myths and Legends. New York: Pantheon Books. ISBN 0394740181. Euler, Robert C. 2002. Havasupai Legends: Religion and Mythology of the Havasupai Indians of the Grand Canyon. University of Utah Press. ISBN 0874804469. Gifford, Edward. 1936. Northeastern and Western Yavapai. Berkeley, CA: University of California Press. Halpern, A. M. 1997. Kar?úk: Native Accounts of the Quechan Mourning Ceremony. Berkeley, CA: University of California Press. ISBN 0520098188. Hinton, Leanne, and Lucille J. Watahomigie (eds.). 1984. Spirit Mountain: An Anthology of Yuman Story and Song. Tucson, AZ: University of Arizona Press, Tucson. ISBN 0816508178. Hirst, Stephen. 2007. I Am the Grand Canyon: The Story of the Havasupai People. Grand Canyon Association. ISBN 978-0938216865. Kelly, William H. 1977. Cocopa ethnography. Anthropological papers of the University of Arizona (No. 29). Tucson, AZ: University of Arizona Press. ISBN 0816504962. Kroeber, A. L.  1976. Handbook of the Indians of California (Bureau of American Ethnology Bulletin 78). Dover Publications. ISBN 0486233685. Luthin, Herbert W. 2002. Surviving through the Days. Berkeley, CA: University of California Press. ISBN 0520222709. Salzmann, Zdenek, and Joy M. Salzmann. 1997. Native Americans of the Southwest: The Serious Traveler's Introduction to Peoples and Places. Boulder, CO: Westview Press. ISBN 0813322790. Spier, Leslie. 1978. Yuman Tribes of the Gila River. New York: Dover Publications. ISBN 0486236110. Waldman, Carl. 2006. Encyclopedia of Native American Tribes. New York: Checkmark Books. ISBN 978-0816062744. Waterman, T. T. 1910. Religious Practices of the Diegueño Indians. Retrieved September 16, 2008. United States Census Bureau. Yuma Reservation, California/Arizona. Retrieved September 10, 2008. This page was last modified on 7 July 2013, at 20:52.